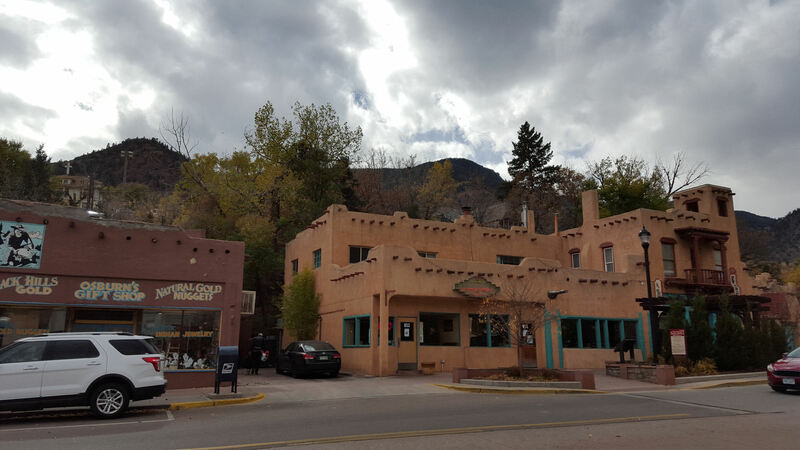 The Springs in Fall — 2015 Photos #26: Mission in Manitou Springs « Midlife Crisis Crossover! One last time in the shadow of Pikes Peak. The week was winding down before we knew it. Anne got off work so late on Thursday that we had time only for dinner and an all-new Sleepy Hollow before she faced one last earl bedtime and one last shift in Colorado Springs. Friday is usually a time for rejoicing in the work week’s end, but this one would prove bittersweet. We loved the mountains and the culinary forays, but we missed our home and our dog, and I’d crossed all the high-ranking attractions off my to-do list. The remaining options ranged in curiosity level from “maybe” to “meh”. 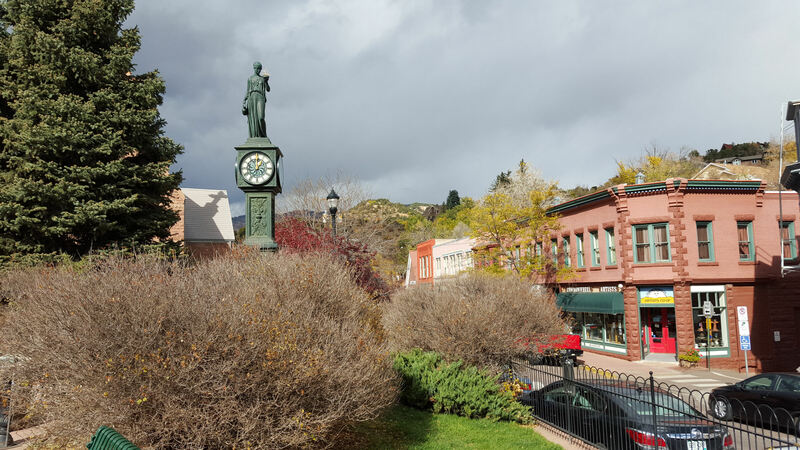 Colorado Springs and the surrounding areas have a lot to see and do for a variety of interests and tourists. Not all of them were for me, but I tried to keep an open mind. I spent the morning of Day Six as a lot of normal travelers might: I lounged around the hotel room for a few hours and did virtually nothing. I procrastinated the MCC Sleepy Hollow recap in favor of reading, relaxing, and catching reruns of Supernatural on TNT. I’d never watched a single episode before, and perhaps it was a bizarre choice to begin my viewership with the season-7 finale and the season-8 premiere, but that’s the beauty of vacation: you get to have fun and break some rules no matter what kind of looks people give you for it. Eventually I snapped out of my lazy doldrums and came up with a plan. I checked out of the hotel, leaving behind ten of the twenty-four bottled waters that I’d picked up on my way to the Cheyenne Mountain Zoo and taking three with me for the road. Just as the previous guests had left us a fresh half-gallon of milk and a box of breakfast Hot Pockets that neither of us could bear to touch, so did we pay it forward to the next guests in our own way. Then I launched myself on a side quest of sorts to cross a few items off Anne’s own to-do list. This wouldn’t just be a time-killer or selfish indulgence: it would be an act of service for someone I loved, frivolous though the targeted treasures might be. And that’s how I wound up once again in Manitou Springs for my final close-ups of the Rocky Mountains. Part of Anne’s routine vacation prep is to compile a list of every smashed penny machine in or near the places we’re planning to visit or drive through. They’ve been her souvenir of choice for years and fill quite a few books in our library. 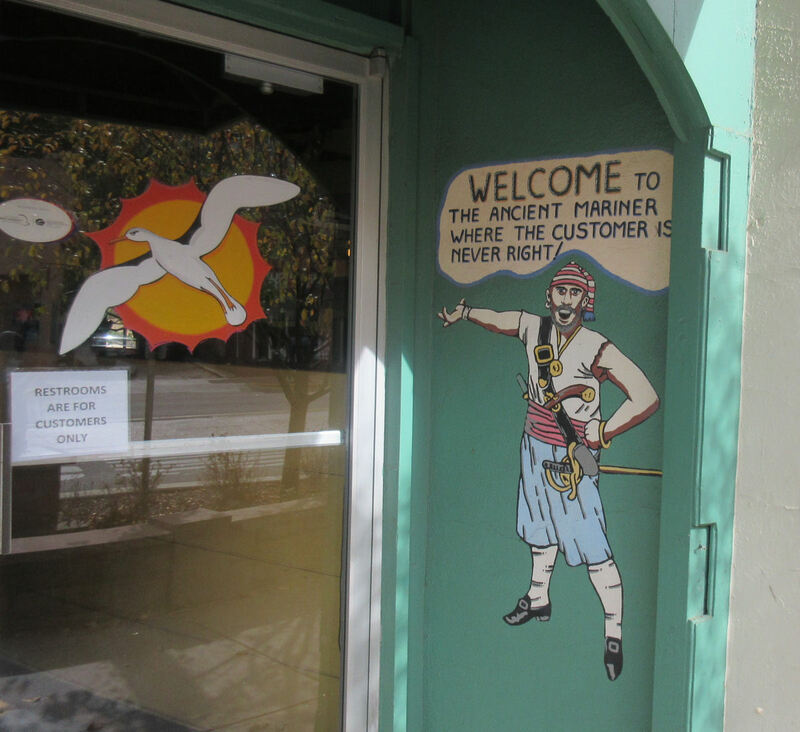 And just her luck, Manitou Springs is a veritable mother lode of smashed penny machines. She scored on our 2012 road trip at the Manitou Cliff Dwellings and the Pikes Peak Cog Railway; I picked up another one on Monday at the Cave of the Winds on the other side of the highway. Four more smashed penny machines were out there for the taking. I parked near one end of town, walked several blocks of its main street (US 24 Business), and tracked down all four. The air was chilly even before the clouds gathered more closely as I walked. It was the least comfortable day of our week, but I had spare change on me, and I was determined to bring ’em back smashed. Two of them were next to plain-looking souvenir stores with not much to photograph. 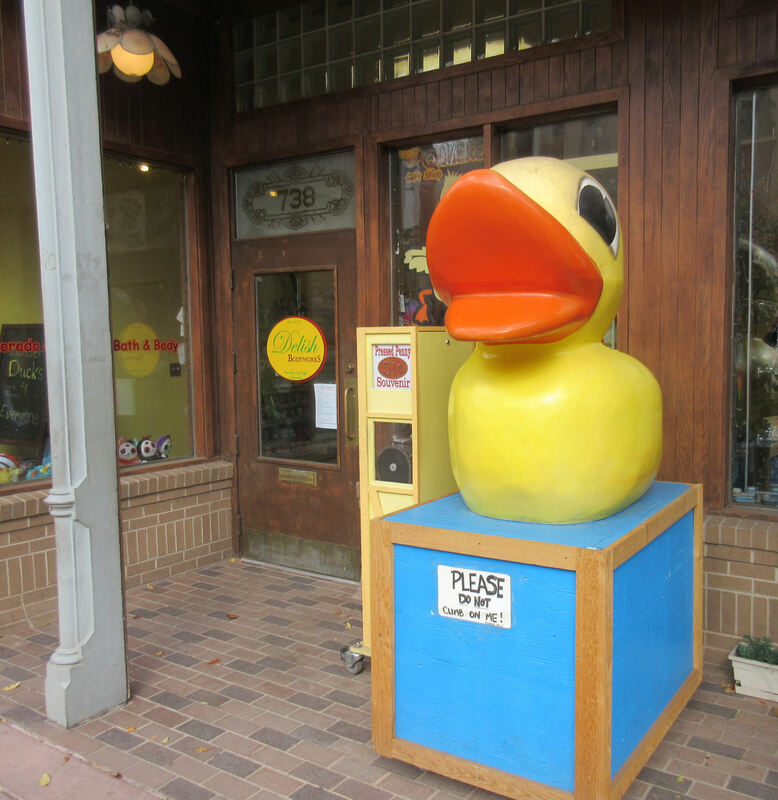 The best-positioned machine shared space with a giant rubber duckie in front of Quacker Gift Shop, a rubber duckie specialty store. The smashed penny design likewise was a tiny, engraved rubber duckie. The unique duckie penny was fine by me. If I’d brought back four identical smashed pennies that all simply said “COLORADO”, I would’ve forfeited all my brownie points. 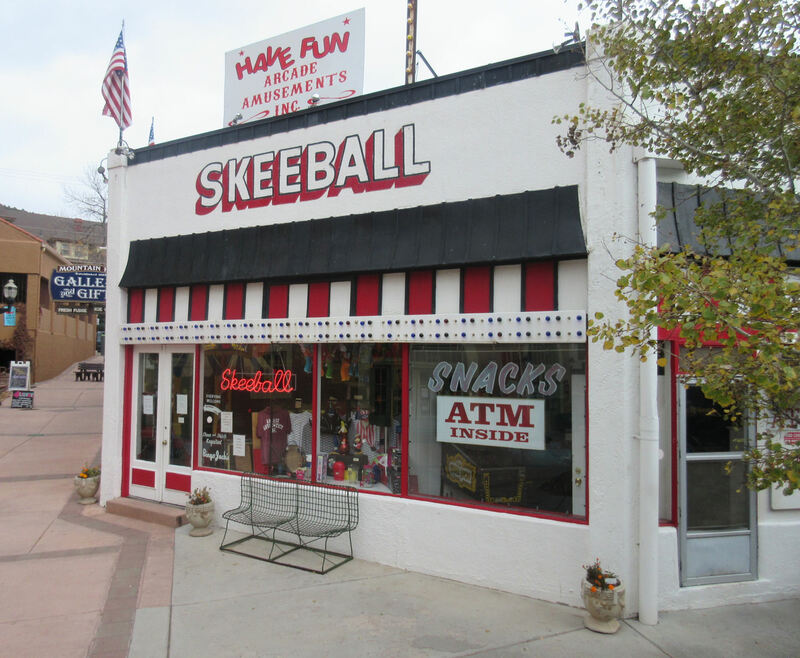 The fourth was inside an old-school arcade filled with Skee-Ball machines and a handful of old-school arcade games clustered in one corner, some of them inaccessibly so. I wasn’t here for games. I just wanted the penny. On the other hand, if they’d had a working Galaga cabinet, I might’ve hung out there for hours and missed our plane. Smashed pennies acquired; achievement unlocked! That’s not to say I did nothing for my own sake. For example: comics! I first noticed C.K. 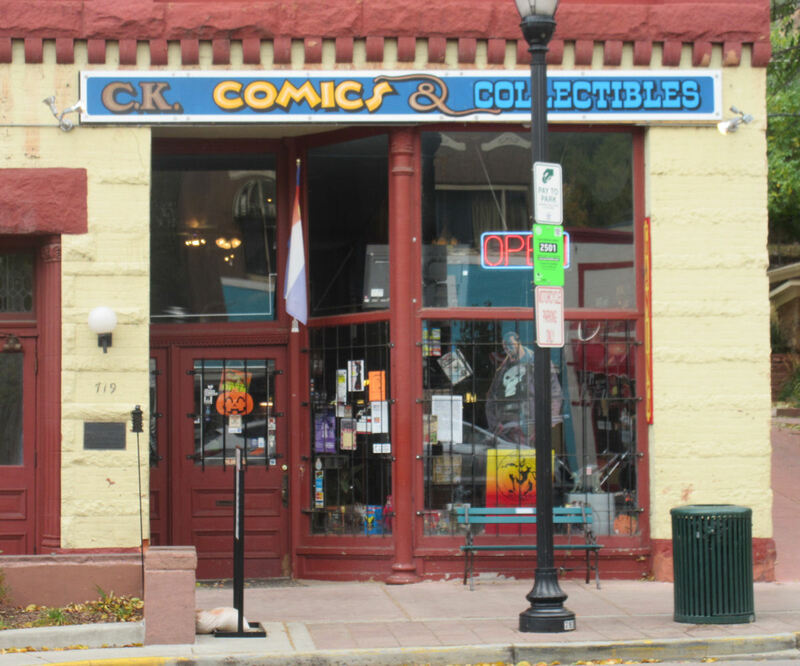 Comics and Collectibles when we drove out of Manitou Springs in 2012, but was too tired to stop. This time, I made the time. By my count, it’s the third-smallest comic shop I’ve ever visited. Nice guy running the place, though I gather the local community isn’t affluent enough to support a full-service experience, so the selection is limited. But I like to help out shops where I can, so I picked up three random Marvel #1s from their recent “All-New All-Different” relaunches and pretended they were souvenirs. Of those three #1s: Deadpool was more of the same that I’d given up a while back; Drax was just-okay, though I did LOL at one part; and The Vision went one to become one of my favorite comics of 2015. Very glad I gave it a shot. 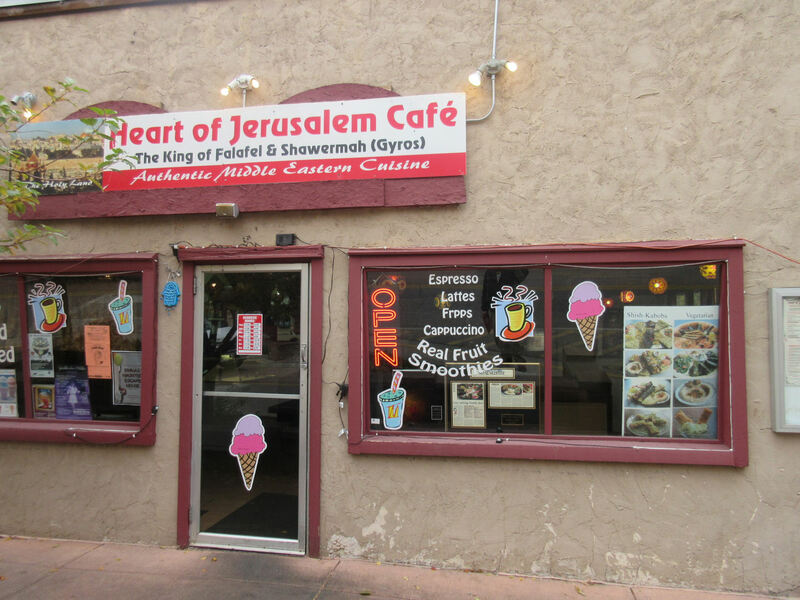 For lunch I went a different direction from the rest of the week with the Heart of Jerusalem Cafe — cozy space, very friendly staff, and they have coffee-bar capabilities, an appreciated advantage on this blustery afternoon. No, I wasn’t there just for Avengers-recommended shawarma. Or shawermah, Shwarma. Shawurma. Shewarma. Chawarma. Sienkiewicz. WhatEVER. The off-season time frame saw a handful of other tourists in town that day, and only a few trickled into Heart of Jerusalem while I was there. More space and more hot drinks for me, then. 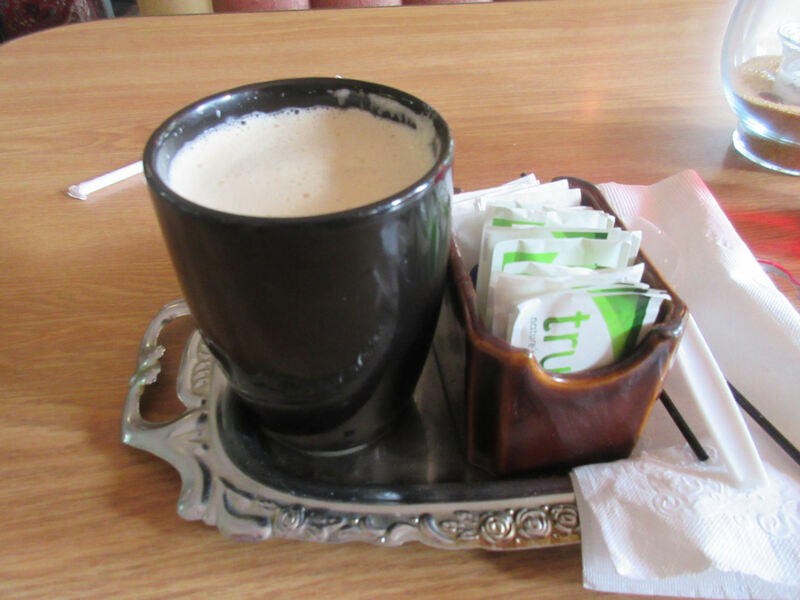 Oh, for a world where every coffee house and chain served a latte so elegantly. 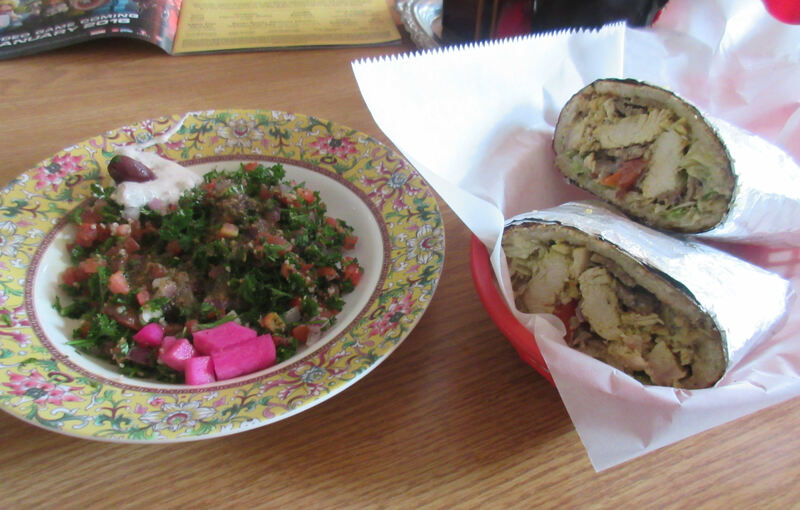 Today’s lunch: the eponymous Heart of Jerusalem shawarma/gyro/sandwich/wrap/whatever (beef, lamb, and chicken topped with hummus, tomatoes, pickled turnips, banana peppers and tzatziki/Gazaziki/whatever sauce) and a tabouleh salad — cracked wheat tossed with olive oil, lemon juice, tomatoes, green onions, and parsley, garnished with a few more pickled turnip cubes. Would eat again several times, 9.5/10. The rest of the afternoon was walking, gawking at storefronts, and trying not to freeze. 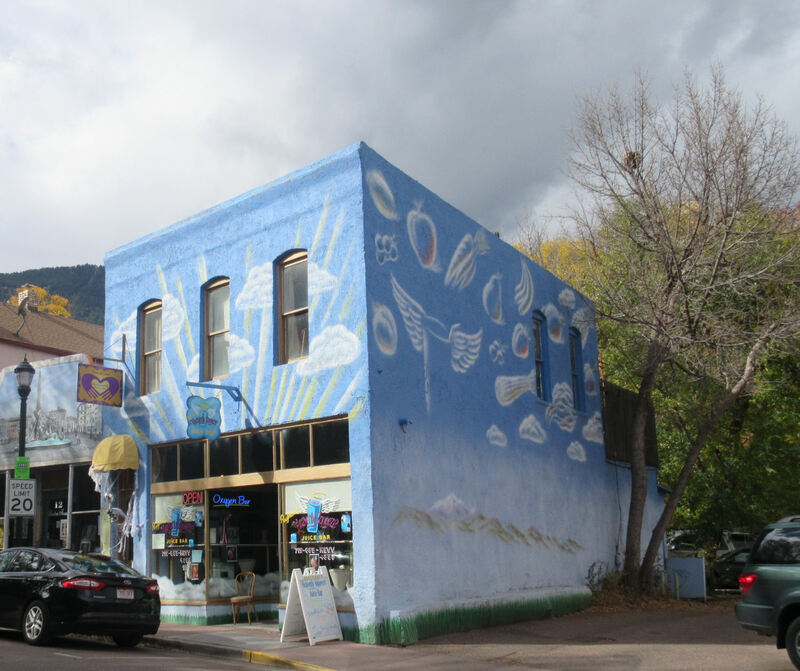 Touches of art here and there enliven this authentic mountainside town. 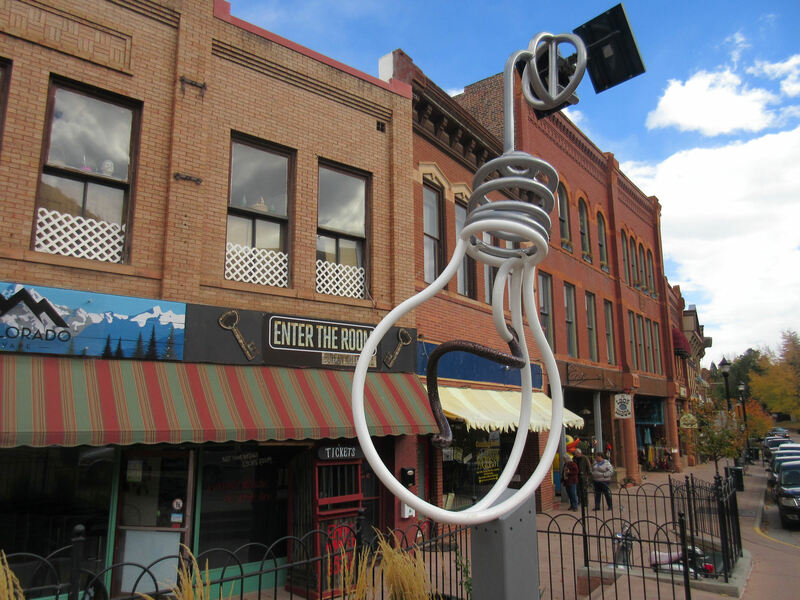 Light bulb sculpture in front of one of those escape rooms that are all the rage. We have one here in Indy, but we haven’t tried it yet. 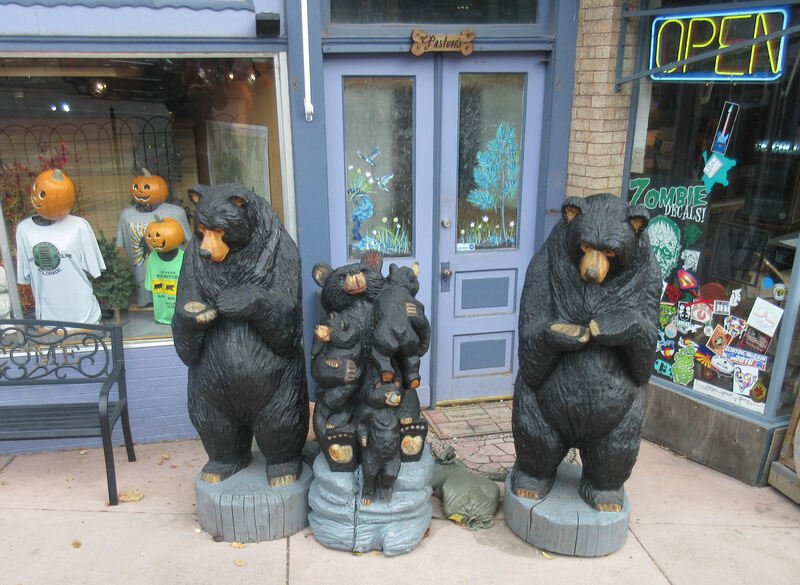 Bear family camps out in front of sticker store. Note the Halloween decorations still up next door. The Heavenly Squeeze Juice Bar wins Best Exterior Color Scheme. The Ancient Mariner dares you to complain and see what it gets you. 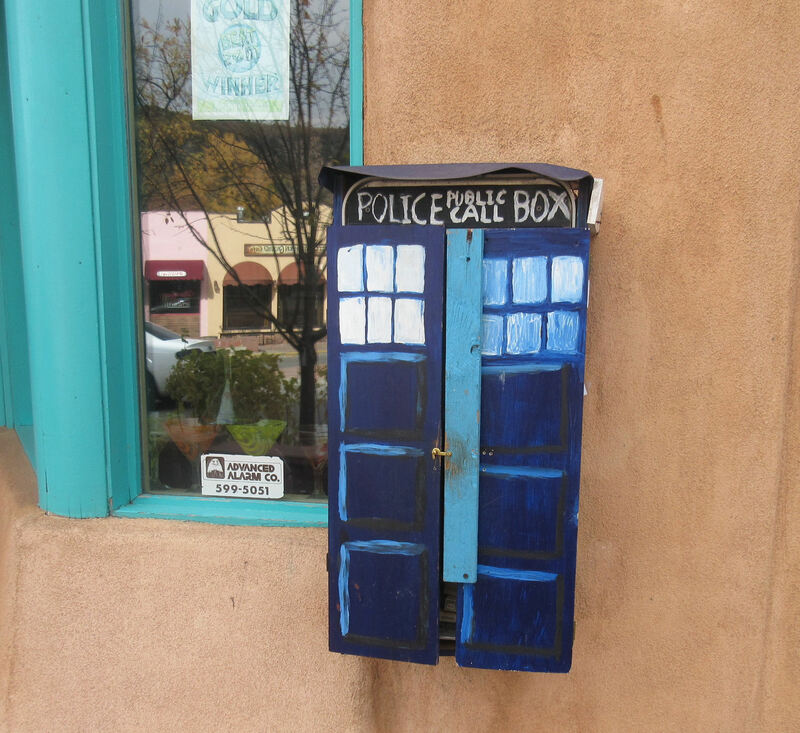 It’s for a really dinky Doctor, but it’s still bigger on the inside. Flourishes of cultural architecture abound. I ran out of commercial spaces to investigate at about the same time I decided I’d had enough of the low temps. 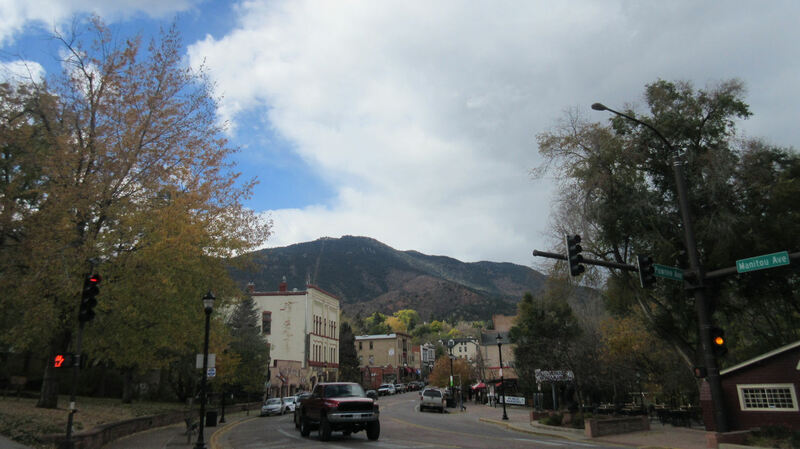 I made the long walk back to the car and bade farewell to Pikes Peak and Manitou Springs once again. Start spreading the news! We’re leaving today! We wanna be a part of ’em — Rockies, Rockiiies! This was barely after 2:00. Anne wouldn’t be off work till 3:00 and the drive back to Colorado Springs wasn’t that far. To kill a few more minutes in warmth, along the way I pulled into the parking lot of the Red Rock Canyon Open Space, did the usual social-media check-ins and watched two underwhelming new trailers for expensive blockbusters I don’t plan to see. Were I to list all the things I liked most about Colorado Springs, my phone company’s local 4G-LTE coverage would be somewhere in the top 25. I arrived at the rendezvous a few minutes before 3:00, picked up the woman I love, and drove us out of Colorado Springs. It was time to go home. I can definitely say I enjoyed the sightseeing more than she enjoyed having to help corral a bunch of untrained, unruly strangers that all the team-building exercises in the world couldn’t have bonded together. To be fair, though, if it hadn’t been for their consistent underperformance, her presence wouldn’t have been requested by her superiors and we wouldn’t be out here in the first place. « Happy First Birthday, Free Earth Day Plant!